Finish with water-based texture and decorative finishes. 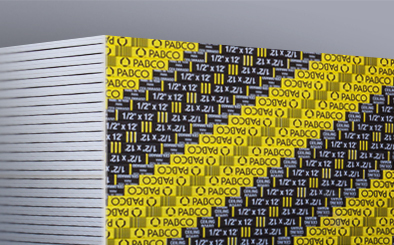 PABCO® INTERIOR CEILING board is a 1/2" thick gypsum panel designed for interior ceiling applications. PABCO® INTERIOR CEILING board is manufactured with specific additives that add to its dimensional stability and significantly reduced the potential for ceiling sag, When tested to the ASTM C 473 humidified deflection test, PABCO® INTERIOR CEILING board exceeds the allowable deflection permitted for 5/8" thick panels.